Are you stressed out over coming up with dinner every single night? Do you wish there was an easy way to prepare all your meals at once (In under an hour) So that it's easy to pull out a meal, place it on the grill and have dinner on the table in just a few minutes? If you're overwhelmed and needing new ideas I've got the perfect Summer Freezer Meals to share with you! During the summer months we love to cook outside and grill almost every night, having things ready to go on the grill each night saves me so much time and money because we aren't rushing around at the last minute. I also love to include Summer vegetables and salads in our meal plan so if I have one of my favorite Meat Recipes ready to go then I can add in a summer salad or fresh fruit and I'm done! This plan has instructions for creating 10 means, 2 of each of these recipes. The Premium Version is the best value! It includes the full shopping list, assembly video with step by step instructions, assembly instructions so you only have to touch each ingredient once, bag labels and my personal Weekly Meal Planning Worksheets! 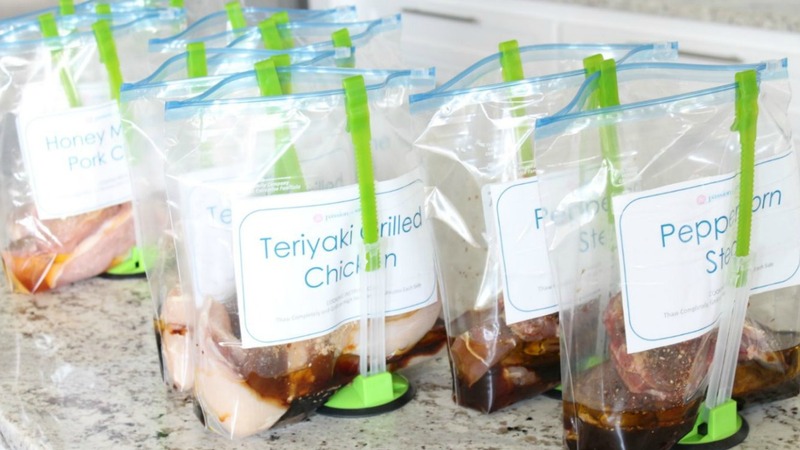 This plan makes it simple for you to stock your freezer with ready to go grill friendly meals in less than an hour! The shopping list is already prepared for you so all you have to do is download, print, shop and assemble! Premium - Includes Everything you need to make this plan SIMPLE and EASY! You'll get our Shopping List, Recipes, Bag Labels, and access to the Full Length Assembly Video. INCLUDES The Full Assembly Video of each Recipe. You can make 10 meals in just under 1 hour! It's perfect for moms who are busy and don't have time for a Freezer Cooking Session because there's no pre-cooking required, everything just dumps into the Bag and then goes straight into the freezer! INCLUDES the Shopping List and Recipes! Assemble 10 Freezer Meal Bags for your grill in just under an hour with our easy to use assembly system and shopping list.